Happy new year, everyone! How quickly 2017 has creeped up on us and now we’re 4 days into the new year! I’ve always loved animals and switching to veganism was something that’s always hovered on my mind. I even went along to Vegan Festival in Edinburgh during the summer last year (see here) to get an idea of what my options were and it was definitely something I’d been keen to do. This month, while everyone decides to give up something to make a change in the month of January, I’ve pledged to go vegan for the month with Veganuary. A lot of people feel becoming vegan is a very huge step to take and hearing how friends switched from being vegetarian to vegan with a transitional stage (where they accept vegetarian gifts from friends but don’t purchase non-vegan products themselves) seemed quite daunting. For the majority of my life, I ate a lot of meat and animal products since it’s a big part of Chinese cooking and since then, eggs and poultry with the occasional meat for Sunday roast for the last couple of years since going dairy free. In the last 4 days though, I’ve not touched (nor thought about) a single vegetarian or meat product. How is that possible? Wasn’t the idea of going from eating some meat and whatever I wanted to solely vegan food not a tad extreme? I’ve been moving towards a cruelty free life for a while now (see here) and eating vegan was the last piece of the puzzle for me. A friend of mine told me about the film Earthlings (here) which is narrated by well-known actor Joaquim Phoenix and it really opened my eyes to what cruelty is involved for animals in the slaughterhouse to provide us with the food we eat get from the supermarkets. It might be the case that there are farmers who are really concerned about the welfare of animals in their care, but compared to the number of farmers and meat, dairy and egg suppliers around the world, what is the actual ratio of number of animals who suffer at some point in their lives to those who never suffer a day? At the end of it all, I could no longer justify consuming animal products, not when it means using (and consuming) them for the benefit of humankind. The aim of Veganuary is to reduce the suffering of animals by inspiring and supporting people across the globe to go vegan for the month of January. It might not seem like much of an impact, but can you imagine how many more animals will be able to live a better life for the month of January if we all decided to go vegan? Chinese people eat vegetarian on Chinese New Year day to give the animals a day of rest away from suffering, what about giving animals worldwide a month of rest? There are so many reasons for switching to veganism, but I won’t go into detail. Everyone has a right to their own opinion and veganism is a personal life choice just as much as choosing a career path. If going vegan has crossed your mind and you’re not sure how to go about it, it’s never too late to try it with Veganuary! 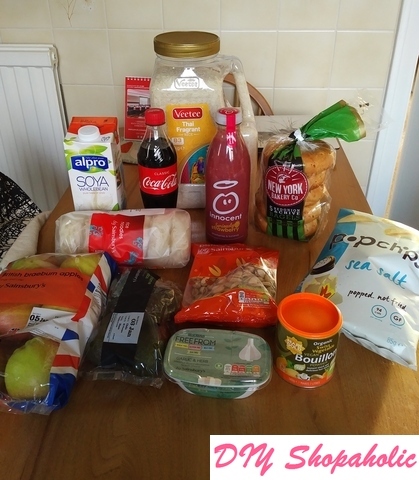 They have a fantastic Starter Kit (see here) that gives you everything you need to know including accidentally vegan products you can find easily in supermarkets and how to find out whether a product is vegan-friendly. You’d be surprised at how many accidentally vegan products are readily available in supermarkets! 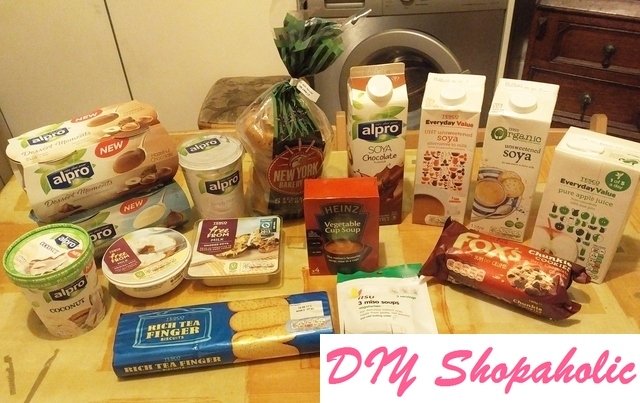 Before I started getting daily e-mails from Veganuary with tips on eating out, shopping and reading ingredients lists, I was concerned I’d be spending lots of money in health food shops for speciality vegan brand for vegan-friendly food. Veganuary has made it so easy to find vegan products without standing in an aisle perusing products for an age. I’ve been testing my ingredient list-reading skills at our local big Sainsbury and Tesco over the last week and in the few visits I’ve made, I feel like I’ve been skimming labels like a pro (scruitinising each ingredient to be absolutely certain it’s vegan-friendly in seconds)! I’ve managed to get a bit overexcited with my mass of vegan-friendly finds! Vegan food isn’t about eating healthy (although that is one benefit to going vegan). A lot more companies are now realising that vegans like to eat just as much as everyone else and has made yummy sweet treats for those of us (me included!) who have a sweet tooth. Supermarkets will also have their own brand products too and I’ve learned from Veganuary that these tend to be vegan, but always check the ingredient list to be certain. Adding milk, eggs or other animal products cost money and to save on these to give you bargain products, these are usually avoided where possible. In my photos above, you can see that not everything I buy is evidently vegan. Sometimes you’ll find supermarket own vegan-friendly products are classed under the ‘Free From’ range, but don’t be scared to check out the regular aisles too! In almost every country, there are usually brands that recognise a need for plant-based milk, whether for vegans or those with a lactose intolerance. 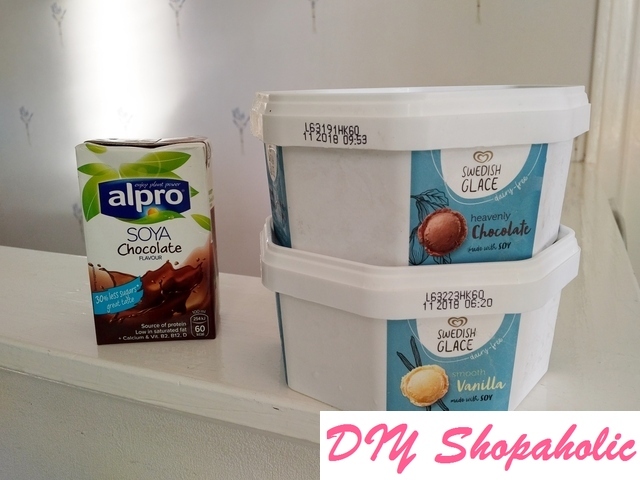 In the UK, Alpro is my go-to brand for plant-based milks (like almond, oat, rice, cashew and hazelnut) and they also produce soy-based single cream and yoghurt. I was excited to see (possibly to coincide with Veganuary?) that my local Tesco Extra has also introduced the Alpro’s newest additions of Dessert Moments and Ice Cream ranges. Couldn’t help myself from getting some coconut and hazelnut chocolate Dessert Moments and ice cream for myself and the OH! The Walls Swedish Glace ice cream for those who prefer some more original-flavoured ice cream. Previously only vanilla was stocked, but now it seems chocolate is going to be a staple too. Swedish Glace ice cream is about £2.20 at Sainsbury and Tesco and are completely vegan friendly! This was my biggest obstacle. Being married to a chef, I’m always (although unwarranted) worried about cooking up a storm. 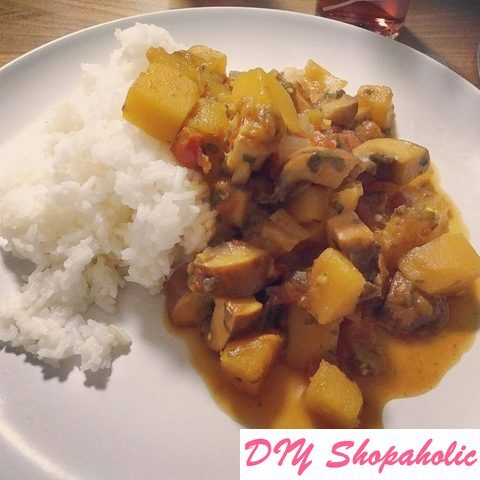 I don’t like serving meals that are easily thrown together and want to impress others with my cooking skills. What can you cook for others when it’s vegan? For inspiration, Veganuary offers lots of recipes that are obviously vegan-friendly, but sometimes I like to take sensible advice from one of my good friends who’s also vegan: simple is always best. At the end of the day, it’s the taste of the dish that people remember, not how long you spent cooking it or how many ingredients is in it. Also check sites which might not seem like the most likely of places as well: stock cube and pot companies. 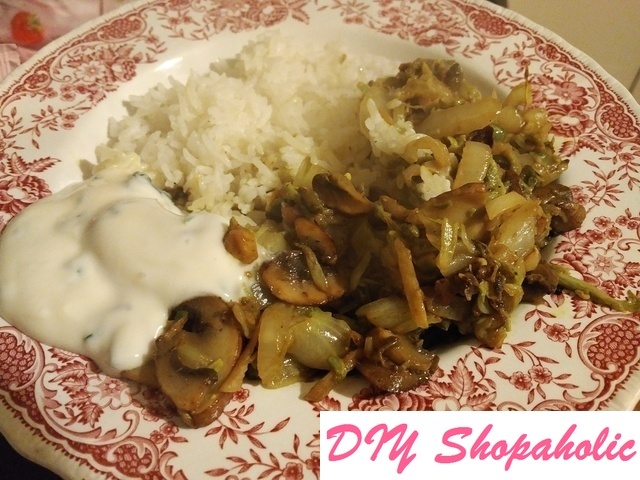 I found the recipe for the very first proper vegan meal I cooked from Knorr’s website (see vegan recipes here)! Without a little help when you’re out and about, it can seem (and maybe feel) like you’re left to walk the supermarket aisles alone. Fear not! The pages in Veganuary’s starter kit (here) are completely mobile friendly, so you can have tabs open on your Internet browser on your screen while you browse those shelves that somehow seem to stock too many choices. When I first started shopping, I had my browser opened on the Label Reading Guide (here) and Vegan Food Essentials (here). If you need a bit of hand holding the first time you venture to the shops as a new vegan, I found testing my label reading skills on accidentally vegan food (list compiled by Veganuary here) helped boost my confidence some before starting to venturing off on my own to try my own hand at recognising vegan friendly food like a bird that flown the coop. I’m sure there are plenty more apps available in your own country that may be useful, but I’ve found the Spoon Guru app (I downloaded it free for Android and is also available for Apple devices. See here) has been quite useful. Once you’ve registered an account, you’ll then be asked to select any food intolerances (like dairy) and dietary requirements (like vegan). This will then ensure that whatever you’re looking for, only those suitable to your needs are displayed. Not only does the offer various recipes which are rated by users, it also has a barcode scanner on the bottom right corner which you can use in the shop to check whether it is suitable or not! Another handy tool I’ve found on the app is by clicking on the ‘Search’ (magnifying glass) tool, you can quickly search for recipes as well as products that the app has already recognised as vegan-friendly which makes shopping a lot easier! A word of caution though, the app is still in its developing stages and products do change over time, so if there are any products that you find should (or shouldn’t) be suitable for vegans, but is not recognised as being vegan-friendly, use the ‘Report Error’ function on the product information to let the app creators know so they can update their information. Eating out doesn’t have to be difficult either and usually if you know restaurants know ahead of time (some specify 24 hours notice, but it would be a courtesy to have a quick look at the menus if they’re available online and check with the restaurant you intend to visit when you call to book a reservation), they’d be quite happy to accommodate. There are more and more restaurants offering vegetarian and vegan menus in Edinburgh and over time I’ll be posting my own non-biased reviews on my blog. When you’re going abroad it might be a bit more difficult, but not with the new app from The Vegan Society! The app, The Vegan Passport (here), is available to Windows, Apple and Android devices and although is a paid app (I paid £1.79 through the Google Play Store for Android), seems a small price to pay. The app has been expanded and updated and with this fifth version supports 78 languages including Hausa, Igbo, Xhosa and Zulu! Travelling to a new country can be an exciting prospect, but trying to explain what you can and can’t eat if the waiting staff don’t understand English can be even more difficult. The Vegan Passport solves that problem quickly and easily: when you get to a restaurant, you simply select the language (or country if you’re not sure) and show your server your phone which will give them an explanation of your dietary requirements in their language. If that’s doesn’t work, you can also choose the ‘Picture’ option that will give them a pictorial explanation of what you can and cannot eat! With the help of Veganuary, choosing to be vegan can’t be any easier. There are also videos of the Veganuary team showing you Accidentally Vegan products as well as how to use their Label Reading Guide as well as a host of other information on their Facebook page here. It’s only been 4 days, but not once have I thought about craving meat nor has it crossed my mind that after this month is over that I will return to eating meat. 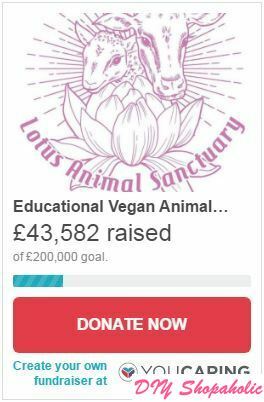 Participating in Veganuary has affirmed that I’ve made a decision that is right for me and to support them further, I have set up a JustGiving page where you will be supporting Veganuary’s efforts to raise awareness about veganism as well as 5 other animal sanctuaries and charities across the world! Remember, even though January has started, there’s still plenty time left of this month to still sign up (here) and join the vegan movement with 50 000 of us! For further information on benefits for going vegan that I’ve been reading since starting Veganuary , see here, here, here, here and here. Note: All views and information above, unless specific with direct links to sources are all my own opinion in support of Veganuary and is not sponsored or endorsed in any way.